IDC reported in the fourth quarter of 2010, global smartphone sales surpassed those of PCs. 100.9 million units were sold in the three month period, representing a 87.9% increase year over year. PCs sold 92.1 million during the same period, which also represented a record for the category, but wasn't enough to edge out smartphones. This is the first time in history that smartphones (which are for all intents and purposes small, portable computers) have outsold PCs. As there are more smartphones out there, we're going to be seeing more and more users taking advantage of the robust feature set of those phones, including mobile Web browsing and using apps of all kinds. As the mix of devices in the public market change, so will user habits and preferences for consuming information and video. Device makers are starting to cover a wider market with mid- and low-range devices that more affordably bring the mobile browsing experience to more users. But as IDC report points out, the smartphone market is still very fragmented, with different operating systems coming from all the leading device makers, from Symbian devices to Apple's iOS and HTC and Samsung's Android devices. And each of these device platforms matches with different standards, especially when it comes to video. That diversity and fragmentation can make it inordinately difficult for online video publishers to be sure they are reaching the entire potential audience without a lot of extra development work. That's exactly why we've made it our mission to simplify video delivery to mobile devices, all the while maintaining a robust viewer experience, no matter where videos play. That's why we've put out the iOS SDK and Android SDKs that include sample applications to assist developers, and our smart players work on mobile devices, no matter what mobile browser and platform your viewers might be using. We continue to improve the mobile viewing experience, and we're one of the first companies testing Flash 10.2 Stage Video API, that will improve CPU utilization efficiency while supporting high-res (1080) video playback, saving mobile viewers lots of battery life. And of course, we continue to support the best desktop video experience with smart players that detect user bandwidth, operating system, and use multi-bitrate streaming to maintain a constant viewing experience, regardless of changes in users' environments. 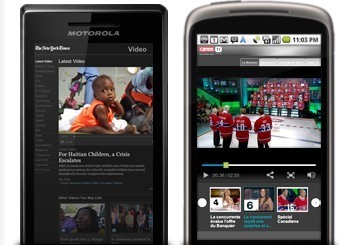 With all those smartphones out in the wild today, how are you changing your video strategy?